Sunday was interesting. I'm still trying to get used to the fact that the musicians have all their music on iPads. See it on his microphone stand? And it's nice that we take food allergies (which seem to be rampant) into account for communion. I enjoy looking at all these organimi birds in our sanctuary. This beautiful girl is 6 years old! For birthdays and Christmas, Mark and I give the grandchildren: something to play with--a Pillow Pet blanket, nice and soft. Something to wear: I deconstructed a dress I won't ever wear again. And something to read: Jamie Lee Curtis was in town as the keynote speaker for a women's conference. In the afternoon she did a book signing at the local Barnes and Noble. Her latest book is perfect for a little girl in first grade. She was funny and gracious, standing up repeatedly for photo ops. When I told her our favorite move (EVER) is Trading Places, and that I had the DVD with me and asked if she sign it as well... just as her publicist, who was sitting next to her, said "No," Jamie Lee said, "Of course! It's a funny movie." Do you ever go out on a limb? Or do you like to play it safe? It's your turn (don't be afraid to post past today--the linky is open until Sunday). great randomness!! I love origami birds - My Granny gave me a book called 'Sadako and the thousand paper cranes' it's so sad but beautiful. I love all your makes and that skirt is just adorable!! I love so many things in this post....the origami birds, the fact that you take photos in church (ha! ), the recycled skirt, the Hello Kitty casing, that you met Jamie Lee Curtis, that you own Apple stock....(wish I did! ), both your incoming and outgoing mail. What a great post. Hope you have a wonderful day! Great skirt. You get the 'Best Grandma"award for this week! We had gluton free communion this week too...must be in the new communion rule book!! LOL! Your communion wafers have garlic flavor? Well, that´s an upgrade from those thin paper ones that stick to your tongue! And I just realized your Ruby is the same age as my little girl. She just turned 8 months on Monday. Sooo big! Happy birthday to the sweet girl!!! I love your gift ideas. I think I have the same dress...was it a Coldwater Creek one? I love what you did with it. Very cute idea. That is a cool origami bird chandelier. And I love the idea of making a pillowcase for a gift bag. How fun to repurpose one of your dresses into such an adorable skirt for Charlotte. 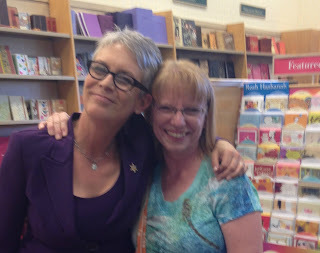 And what a thrill to meet Jamie Lee Curtis. You've had quite a great week! Way to go on the Apple stock. Sell, sell, sell! ;) LOVE that pillowcase. Where did you find that Happy Birthday fabric? Glad you liked my postcard! This is a fun post filled with all sorts of stuff to think about: jealousy over your Apple stock and getting to meet Jamie Lee Curtis, fun birthdays with grandkids, and the noticing things during church (which is what I do too). Always fun to read your Random Thursday posts! p.s. Jamie Lee Curtis is my 'older lady' hair model. Basically, I'm just going to stick with my current style and wait for it to be more salt than pepper. So much to love about this post Cindy! Happy birthday to your sweet granddaughter!!! Very cool gifts you gave and made and brilliant to make a pillowcase as the gift wrapping. My daughter's school has gone to using iPads in the middle and upper grades. Her orchestra is using ipads for their music as well and she even does her violin homework by playing, recording/videoing on an app and sends it in that way! I am envious of your Apple stock and meeting Jamie Lee Curtis. Trading Places is a favorite of mine too. That's so danged cool that you met Jamie Lee Curtis! Guess that's what happens when one lives in California where the stars do. Our favorite Jamie Lee Curtis movie is "True Lies," and she's really great is NCIS. Darling skirt. What a great upcycle project. And good for you with the Apple stock! Good for you!